The new leaders of two of the state’s largest policing agencies shared their approaches to collaboration and police partnerships. Maricopa County Sheriff Paul Penzone discusses his approach to law enforcement with Phoenix Police Chief Jeri Williams and moderator Sarah Strunk of Fennemore Craig during a Greater Phoenix Chamber of Commerce Premier Leadership Series event on Feb. 23. Arizonans didn’t get just two decorated law enforcement leaders in Phoenix Police Chief Jeri Williams and Maricopa County Sheriff Paul Penzone, they got two genuine friends who came up through the Phoenix Police ranks together and share a community-centric, transparent and collaborative approach to police work. 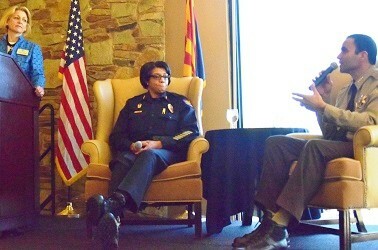 The new leaders of two of the state’s largest policing agencies shared their approaches to collaborative law enforcement and facilitating police partnerships with business, law enforcement and political leaders during a Greater Phoenix Chamber of Commerce Premier Leadership Series event on Feb. 23. Engaging these law enforcement leaders in a direct talk with business leaders was the result of GPCC Executive Board members considering how the business community can most effectively support law enforcement. It was an ideal time to initiate a discussion, given that both Williams and Penzone are early in their leadership tenures and place a high value on collaboration. Penzone spent 21 years as a Phoenix police officer and won numerous commendations and awards for his leadership and work ethic. He is a champion of his agency and its employees. “The men and women of the Maricopa County Sheriff’s Office are exceptionally talented, ethical and are very good people. I truly believe this office has been misrepresented for far too long and it’s time to give those men and women a chance to shine,” Penzone said. Penzone and Williams highlighted the value of a strong, active relationship between businesses and law enforcement. “How we are viewed as community on how we treat people directly impacts the growth and development of business owners…It is my responsibility to show discipline, ethics and professionalism so that whoever comes here knows that they will be safe and their business can thrive,” Penzone said. Williams challenged the business leaders in the room to develop a business advisory board to facilitate communication and solutions between police and business. Penzone mentioned his outreach via the Sheriff Penzone Executive Advisory Review (SPEAR) group, which evaluates MCSO programs including Tent City. Williams and Penzone further highlighted the successes of their forces, especially when out in the community and asked to not be judged with every police department across the country. Penzone closed his comments highlighting the high regard he holds for police officers and the expectations he has for himself and his department. During her closing remarks, Williams emphasized that her department is hiring 18-25 officers per month and has openings right now. Click here to watch a recap of the event.